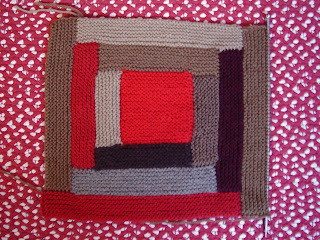 I am thrilled with it, especially since I love projects that use up odd balls of yarn. If I had thought and thought about what I should be knitting, I would never have come up with this project. Of course I know there are no 'shoulds' in kitting, but you know what I mean. At least you do if you are something of a planner like I am. The idea must have come from two sources: Mason Dixon Knitting, of course, for the log cabining idea and a fellow blogger for the color scheme. I admired the use of reds and browns together in this pair of socks designed by Susan of 3 Sleeves to the Wind (love that blog name). The colors must have jogged the log cabining idea from the back of my mind. And I suppose that the catalyst of it all was afghans for Afghans, which had just posted a new campaign specifying the need for, among other children's things, child-size blankets, of which this will be one. Log cabining is quick, easy, and relaxing. I might have to log cabin all the time. You keep binding off and picking up stitches to make strips, in garter stitch, around a central square. Easy peasey lemon squeezie as I recently heard someone say. The technique lends itself to all sorts of creative variations. 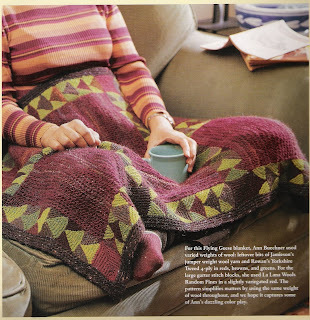 This Flying Geese blanket from the first Mason Dixon Knitting book is a variation and, I think, one of the most beautiful knitted object I have ever seen, made in my favorite color combination. Thank you Mason Dixon Knitting. 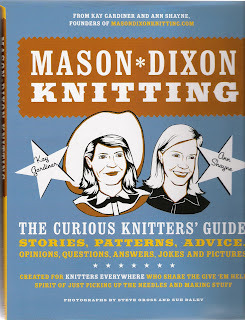 This book and its sequel are idea books more than pattern books, although they have patterns too. Thanks to this serendipitous project, I had to take down the book, and now I'm going to read through it again from cover to cover. Perfect January knitting and reading. Darn! I liked the color combo in your square and was eager to click on your link to see those socks. Then I realized it linked to my blog. :/ No wonder I like the colors. Thanks! You and Laura have some nice afghans started.